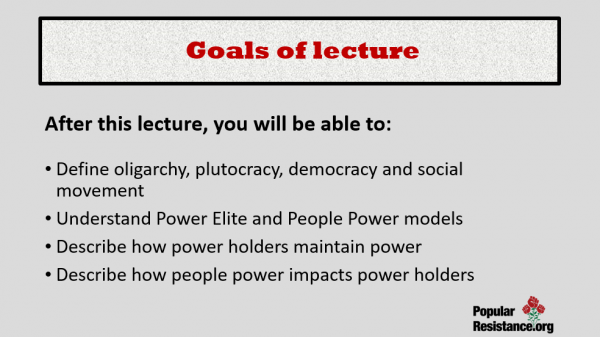 We review definitions of oligarchy, plutocracy, democracy and social movement; studies on oligarchy; two models of power, the Power Elite model and the People Power model; how elites maintain the status quo and how popular movements counter the elite’s actions. There needs to be a revival of democracy through “people power”. The increasingly centralized power of the state and other social institutions, combined with the new use of the mass media to carry out the political process, has all but eliminated effective citizen participation in the decision-making process. 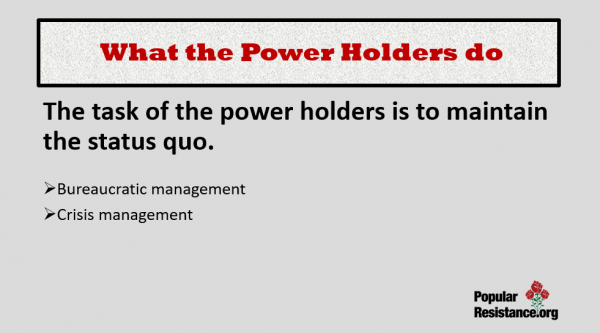 Centralized powerholders now make decisions in the interests of a small minority, while simultaneously undermining the common good and aggravating critical social problems. 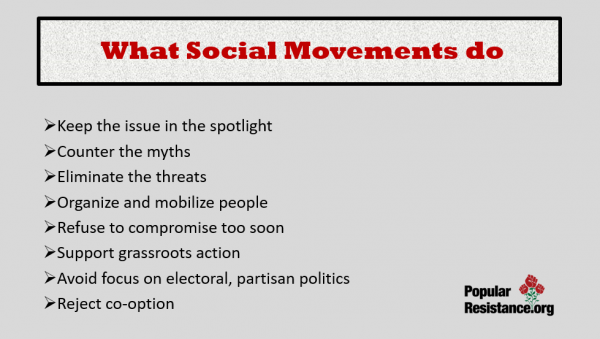 Nonviolent social movements are a powerful means for preserving democracy and making societies address critical social problems. They enable citizens to challenge the prevailing centers of power and become active in society’s decision-making process, especially at times when the normal channels for their political participation are ineffective. Social movements mobilize citizens and public opinion to challenge powerholders and the whole society to adhere to universal values and sensibilities and redress social problems. At their best, they create an empowered citizenry, shifting the locus of social and political power from central elites and institutions to new grassroots networks and groups. 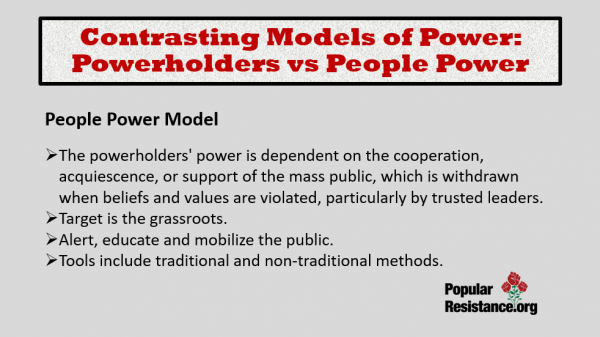 The People Power Model holds that power ultimately resides in the mass populace. 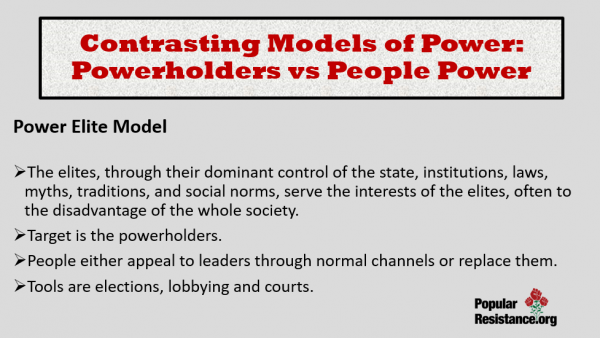 Even in societies with strong power elites, such as the United States or Marcos-led Philippines, the powerholders’ power is dependent on the cooperation, acquiescence, or support of the mass public. This model is represented by an inverse triangle, with the people at the top and the power elite at the bottom. 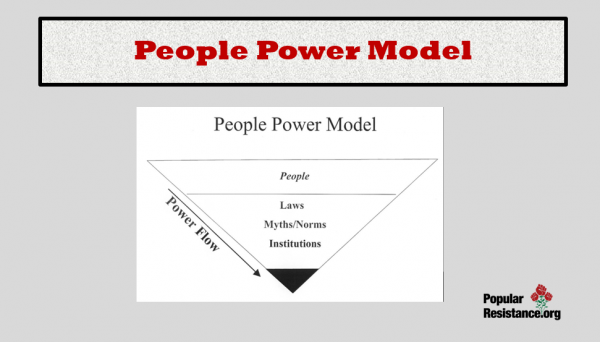 People power is the model used by social movements. 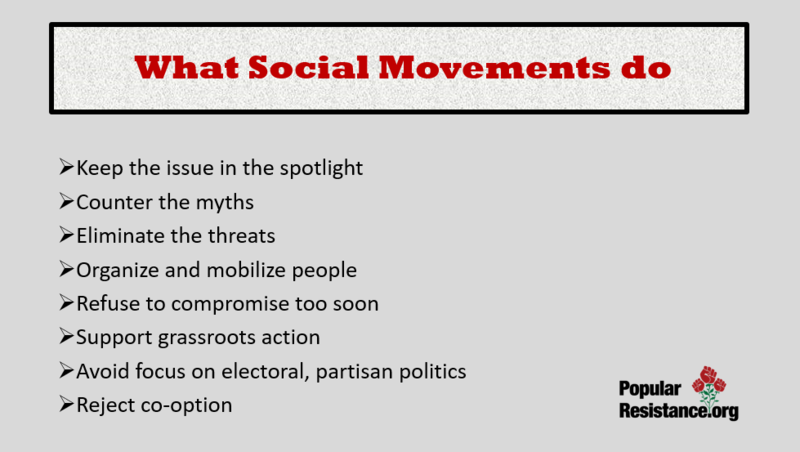 The movement’s strategy is not only to use normal channels in an effort to persuade powerholders such as President Reagan to change their minds, but also to alert, educate, and mobilize a discontented, impassioned, and determined grassroots population using nonviolent means beyond the normal parliamentary methods institutions. 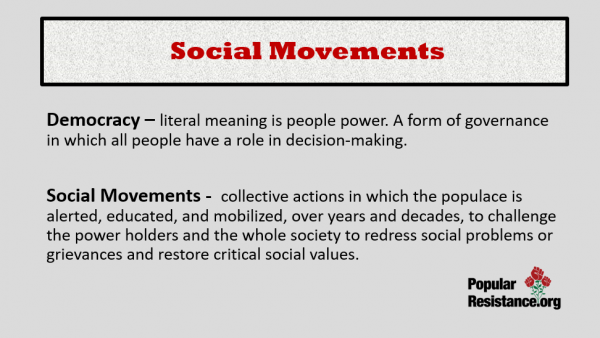 Social movements derive their power from an upset, impassioned, and motivated populace set into motion. This happens when people recognize that their strongly felt beliefs, values, and interests are unjustly violated, and the population is provided with hope that change can happen and a means for them to act. People are specially aroused to action when trusted public leaders, such as the President or Congresspeople, violate the public’s trust to carry out their duties of office in an honest and lawful manner. 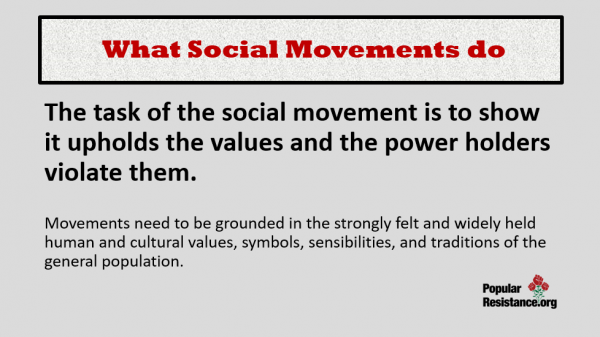 The process of achieving social change through social movements is the struggle between the movement and powerholders of the hearts, minds, and support (or acquiescence) of the general public. 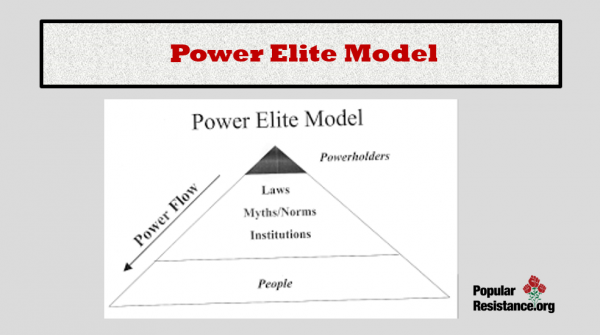 The powerholders advocate policies that are to the advantage of society’s elites, but often to the disadvantage of the majority population and in violation of its strongly held values. Before movements begin, however, the populace is usually unaware of the problem and the violation of their values, but they would be very upset and easily spurred to action if they knew. 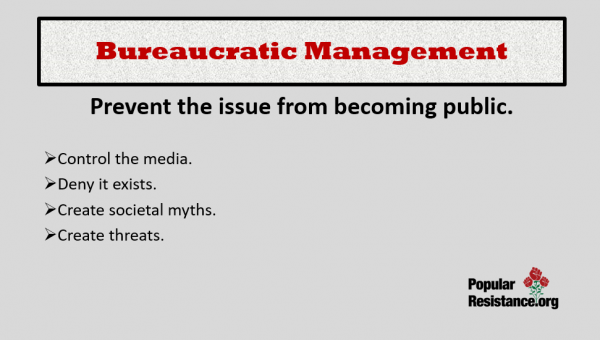 The first line of defense is through a strategy of “bureaucratic management” to prevent the issue from becoming a public issue. This is achieved by (1) “internalized obedience,” keeping the problem out of the public’s view of the world and thereby out of people’s consciousness; (2) keeping issues out of the public spotlight and off the society’s agenda; and (3) keeping the issue off of society’s political agenda of hotly contested issues. 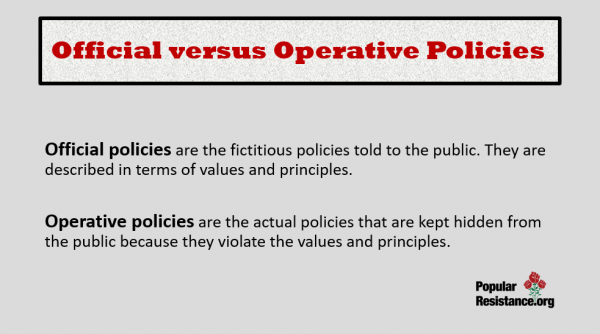 Some of the means used by the powerholders to achieve this strategy are the following:(1) maintain hegemony of information available to the public through the media; (2) deny that the problem exists (e.g., “no arms have been sent to Iran”); (3) create “societal myths” which define the problem for the public exactly the opposite of reality, such as calling the contras “freedom fighters” or saying that the Marcos Duvallier governments were part of the “free world”; and (4) create the threat of demons, such as Communism and terrorism, to install fear in the general population so that they will unquestioningly support whatever policies the powerholders take. 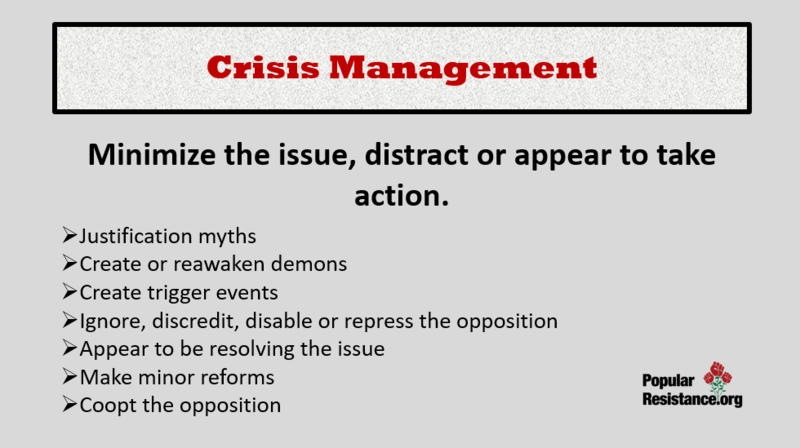 After a policy becomes a public issue, the powerholders are forced to switch to a “crisis management” strategy by doing the following:(1) vindicate unjust policies through “justification myths”, which explain that their policies are needed to overcome a bigger evil (e.g., “we need to support President Marcos, a minor dictator, to prevent the worse evil of the Communist takeover in the Philippines”); (2) re-emphasize old demons or create new ones; (3) create trigger events to justify a new policy and to get public consent, such as when the American Government got the support of the American people for escalating the Vietnam War by proclaiming that American ships were attacked in the Gulf of Tonkin; (4) overcome public opposition by first ignoring then discrediting, destabilizing, and if necessary, repressing the movement; (5) appearing to be involved in a resolution process through promises, new rhetoric, appointing studies and commissions, and negotiations, as in the Geneva nuclear arms reduction meetings; (6) make minor changes through reforms, compromises, and cooptation of opponents; and (7) coopt the opposition. Keep the issue and moral violations in the public spotlight and on society’ agenda of hotly contested issues. Keep the issue and powerholders’ policies on society’s political agenda, such as having aid to the contras voted on in Congress rather than carried out secretly by the CIA. 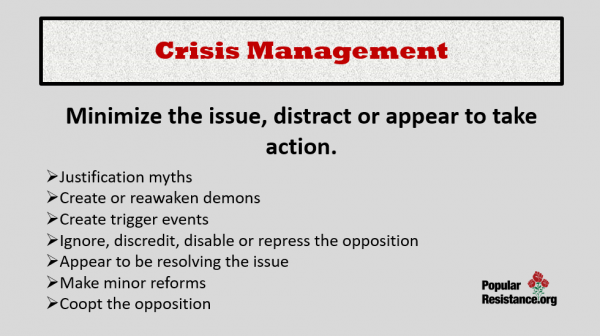 Counter the powerholders’ social myths, justifications, and denials that the problem exists. Counter the powerholders’ demonology. For example, the thousands of American “citizen diplomats” who visit Russia counter the Reagan demonology that the Soviets are monsters and an “evil empire” by revealing that the Russians are people like us. Involve increasingly larger portions of the public in programs that challenge the powerholders’ policies and promote alternative visions and programs. Don’t compromise too much too soon. After a large majority of public opinion is won, have an “endgame” strategy that mobilizes the populace and institutions to create change, despite the determined opposition of the central powerholders. Finally the movement’s organizations and leadership, especially at the national and regional levels, should serve, nurture, and empower the grassroots activists and promote participatory democracy within the movement. Testing Theories of American Politics: Elites, Interest Groups and Average Citizens by Martin Gilens and Benjamin I. Page, 2014. 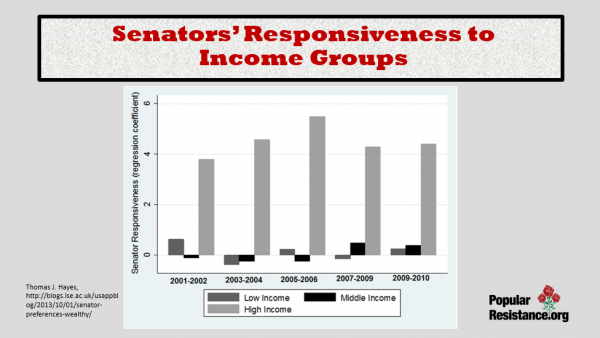 Senators of Both Parties respond to the Preferences of the Wealthy, and ignore those of the Poorest, by Thomas J. Hayes, 2013. Why Competition in the Politics Industry is failing America by Katherine M. Gehl and Michael E. Porter, 2017. 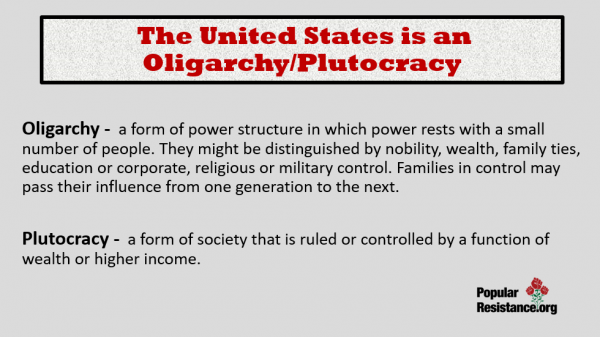 How did Corporate Power get a Stranglehold? (The Powell Memo), 2011. 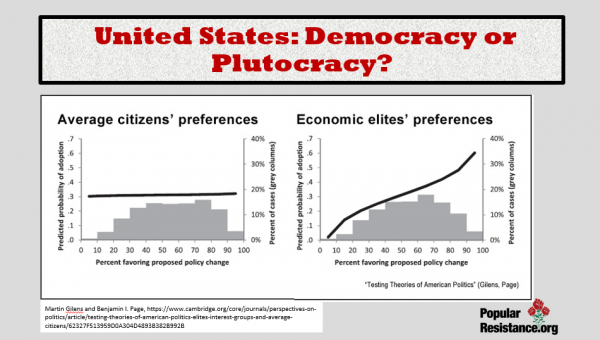 Lifting the Veil of Mirage Democracy in the United States by Kevin Zeese and Margaret Flowers, 2013. Fighting for a Legitimate Democracy by and for the People by Kevin Zeese and Margaret Flowers, 2014.